Children are attached to their toys. Since they’re going to be dragging them through the house and all over the place, it only makes sense to load it up with some apps. Edwin the Duck is a smart toy disguised as a rubber duck. Edwin, on the outset looks just like a rubber duck, the kind that you throw in a bath. 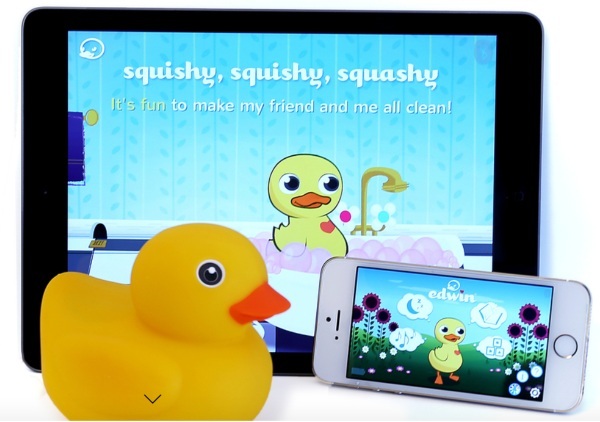 The difference is that Edwin connects via Bluetooth to become more than just a bath toy. Edwin helps children work on reading with animated stories. You can throw him in the bath with you and he’ll monitor the temperature while singing songs. You can even take him to bed and the duck will generate white noise or lullabies to help your child sleep. Edwin is designed to grow up with your child with new content being added all the time so this duckie will hold your little one’s interest for a long time to come. You can choose what to put into your child’s library to ensure that everything is just right for their growing brains. Edwin the Duck is available for pre-order at $99 each.